TAMPA, Fla. -- Some say they’re nerds; some say they’re quirky. Nevertheless, they are often admired for their above average GPAs. But according to Michael Mormino, a senior at the University of South Florida majoring in chemistry, they’re just cool. 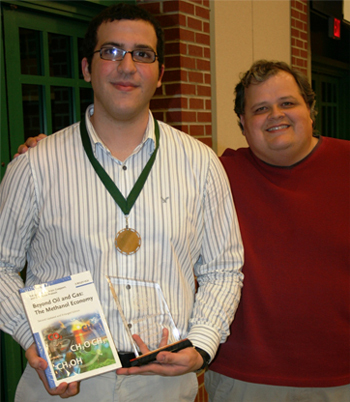 Mormino is one of several USF students who received an unexpected award at the Department of Chemistry’s 25th Annual Celebration, held Feb. 21, 2012, at the USF Alumni Center. The event honors outstanding students with awards and scholarships that are donated by alumni and friends of USF. Like many of the students who received an award, a scholarship or both, Mormino didn’t expect to win anything. As it turned out, he won three of those! Sometimes those like-minded people take a different route but still end up in the winner’s circle. They start out seeking a different degree, but the effects of studying chemistry overtake their original ambitions. That’s what happened to Jennifer Wedebrock, a senior at USF now majoring in chemistry. “I started out in chemical engineering, but then I realized I liked the chemistry classes much better, so I decided to switch majors,” Wedebrock said. Her switch paid off; as result of her efforts, she won two awards that night. An event such as this doesn’t just happen; it requires a great deal of planning. And according to Kimberly Read, the manager of fiscal and business planning for the Department of Chemistry, this year’s event required extra attention. “The minute one event ends, we start planning the next one,” Read said. According to Read, it was a tremendous success in part because of help the chemistry department received from the USF Alumni Association in getting the word out about the event. Read also said the entire staff pitched in to make the even a huge success.